In Summer Yellow with black trim. This left hand drive 914 was supplied new to Onatario in Canada and kept by its one lady owner there until importation in to the UK in 2015. It is fitted with its original 2.0 litre engine running on fuel injection, and desirable five speed gearbox. The rare and correct Fuch alloy wheels are in excellent condition. The lady appears to have enjoyed her Porsche as she had already covered 20,000 miles by February 1974 when Centenial of Hamilton (VW/Porsche main agents) serviced it for her. The service history is very good and follows all the way through 73,000 miles in 2013 and shows constant maintenance and upkeep including a full interior retrim in 2011. In 2015 the engine was stripped by a Porsche specialist to cure oil leaks. A Porsche Certificate of Authenticity comes with the car confirming its numbers and specification. The bodywork is in good order but does have some minor paintwork blemishes on close inspection. The underside has had some repairs over the years. The interior is excellent and even the Targa top fits well. 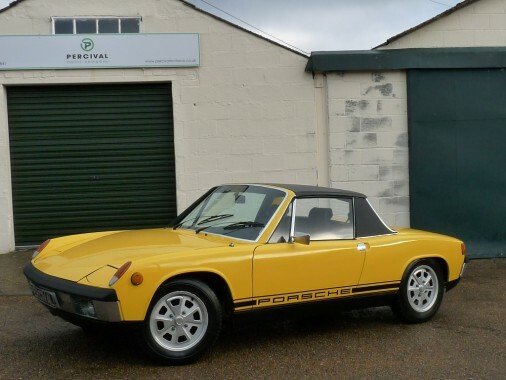 Good 914s are hard to find as most have been neglected but this car is lovely and clean and straight, has a superb service history, retains its original engine and is still in its original colour.